Great promotional cotton eco tote bags. Very affordable for all. Highly recommend everyone checking out this company. Very durable bag for such an affordable bulk sale price point. Thanks CEP for all that you guys have to offer. This cotton promotional bag really did the trick. Needed a promotional bag just like this to advertise by business and give it a nice jumpstart. Thanks CEP. I own my own business and decided to invest in these bags to help promote my business and get my brand out there. So far it seems to be working. Sales have gone up since I started giving out these eco-friendly promotional cotton bags. Great shopping bag with an awesome cotton interior. This bag is interior along with every other item on the CEP site. Highly recommend using this company. Not only was this bulk order purchase a great business promotion but I also personally use this bag almost everyday. I've had it for awhile now. Very durable. Get a step up on your competitors with Custom Earth Promo's Promotional Cotton Tote Bag! With full creative freedom, you can customize our bags to fit your company needs. Looking to reach your eco-friendly market? Let your customers sport our 100% biodegradable canvas bag while spreading your company message! Our bag is made with durable 6 oz cotton, perfect for groceries! Increase brand exposure for your business and make an impact for the environment with these recyclable bags. Customers will love the multi-use nature of our cotton tote bag. Use for groceries, school books, or as an overnight bag! Make an impact on the environment by using our 100% biodegradable to promote your brand on the large imprint area! The 8" W x 10" H x 4" D bag size also lets you get the most use for your clients! 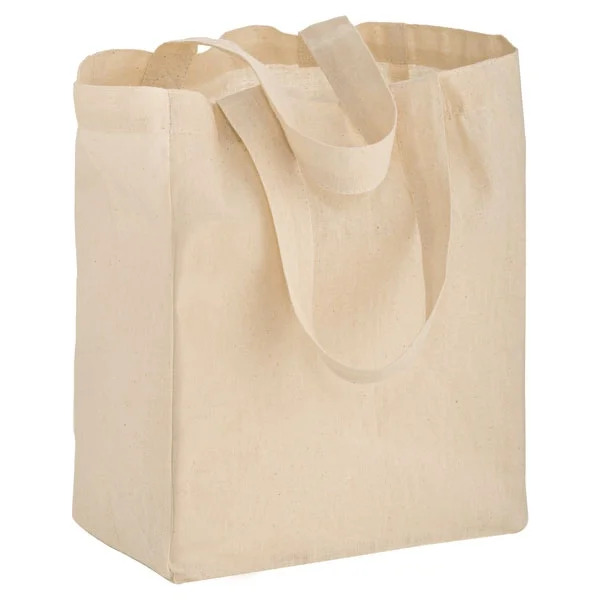 Unlike regular grocery bags, our cotton tote bags give durability in the 6 oz thick canvas material. The reusability and recyclability of this canvas bag makes it a must have for your eco-friendly market! Cotton is known for it's sustainability and long-lasting material, great for representing your brand. Comfort for your customer is guaranteed with 12" handles and a spacious interior, providing support and maximum usage! There are many color imprint options, with over 26 choices for your brand to identify with. The 6" W x 6" H imprint area gives you a big space for your big company statement! As a more eco-friendly option than traditional plastic grocery bags, the cotton fiber in our canvas bags is 100% sustainable and recyclable. They're perfect for promoting to your green market! By purchasing this tote, your business will be able to increase brand exposure and do something good for the environment! By providing our customers with the best in service, customization, and overseas production, Custom Earth Promos is perfect for finding your next promotional eco tote! We provide max flexibility for your company's creative agenda, so that your marketing products represent exactly what your brand stands for! Per usual, our materials are made with the most eco-friendly and durable components possible.